Announcement Horse themed jewelry & gifts...I design and hand make the most exquisite Horse lovers & Equestrian theme gifts & jewelry. I hand sculpt my jewelry first in clay, mold and then produce in pewter. Some of my designs I produce from my drawings as engravings and etch them into hand cast and rolled mirror polished pewter. All my work is made by me in my studio. I produce my hand crafted work for the finest collectors and clients across the USA. Horses and the creating of horse art is the passion of my life. 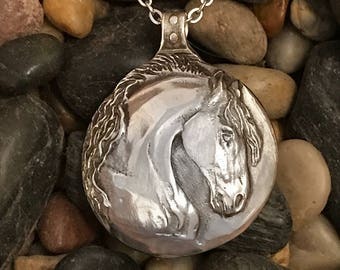 Horse themed jewelry & gifts...I design and hand make the most exquisite Horse lovers & Equestrian theme gifts & jewelry. I hand sculpt my jewelry first in clay, mold and then produce in pewter. Some of my designs I produce from my drawings as engravings and etch them into hand cast and rolled mirror polished pewter. All my work is made by me in my studio. I produce my hand crafted work for the finest collectors and clients across the USA. Horses and the creating of horse art is the passion of my life. Absolutely beautiful!! Very pleased and will definitely order from her again. Arrived promptly in very nice packaging. Definitely would recommend. Great price and excellent quality pieces!!!! Horse Lady Gifts is an all Hand Made & Made in America shop specializing in Horses. I love horses and design the most exquisite horse jewelry for horse ladies....Horses on everything!... and some dogs too. We love our animals! 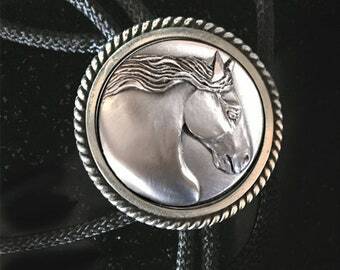 All Horse Lady Gifts jewelry is cast in pure certified ' food safe' tin-pewter and polished to a mirror finish. All findings (chains, etc.) are also made in America. I am the artist and I design & make all my products, from sketch to clay model to metal castings, finished and formed. Refunds are granted on quality issues and for wrongly shipped items. Please send me a message with a phone photo of the problem and I will get back to you with an address for the return. No returns or refunds after 14 days. For items damaged in shipping, a photo of the outer box and the damaged item with the USPS tracking number will suffice in place of a return. Refunds are applied only to the credit card or PayPal account used for the purchase. Please double check the address you give me to avoid lost packages! If you find you must cancel, please let me know within 24 hours of your order. Thank you! If you have an issue with an item please send me a phone photo to review. Thank you!